Pool packages include, braces, timber, reinforcing steel, stainless steel pool wall, metal rails, liner, liner clip, sand filter, self prime pump, wall skimmer, eyeball return, vacuum brush-head and hose, extension-handle, leaf scoop, test strips , pool broom, thermometer. Installation includes all materials and labour for the construction of the pool. Prices do not include excavation and soil removal, permits, architectural and engineer’s drawings. These services are available in addition to the pool cost. Standard engineering producer statement and drawings are $350.00, but if council require a PS4, this will an extra cost. Economy pool has no concrete beam so suited for a deck to be fitted out over the top edge of the pool. NB. all pools with standard engineering design have a wall height of 1.2m. The extra depth is shaped as a bowl somewhere in the middle of the pool. 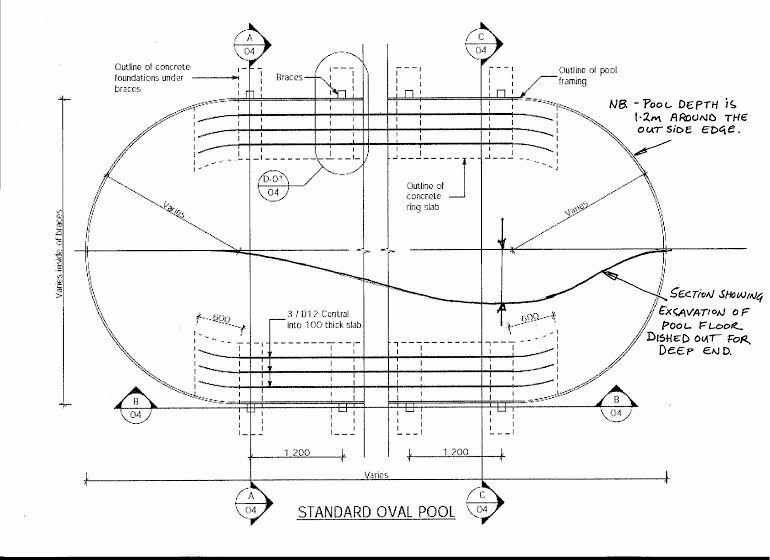 (as shown in diagram below) Pools can have higher walls but they need to be custom re-engineered. Deluxe pool has a concrete beam around the top edge and 250 x 250 bull-nose copings. Includes, pool wall, braces, rails, liner, liner clip, pump, filter, vacuum brush-head and hose, leaf scoop, tele-handle, test strips, thermometer, skimmer, eyeball return. Installation includes supervision of excavation, all materials and labour for the construction of the pool. NB. Does not include excavation or soil removal costs. Contact us now to build your pool!